With gravel racing and riding in full swing, we’ve been looking at gearing options to make the most of your existing bike, helping your cyclocross rig do double duty. In part one of our look at going lower on your gearing, we talked about the relative ease of switching to a wide-range cassette. This is a particularly attractive option for riders with 1x setups that don’t necessarily want to invest in a front derailleur and shifter, not to mention a possible new crankset. E*Thirteen’s new offering is interesting. It is actually a three-part cassette. 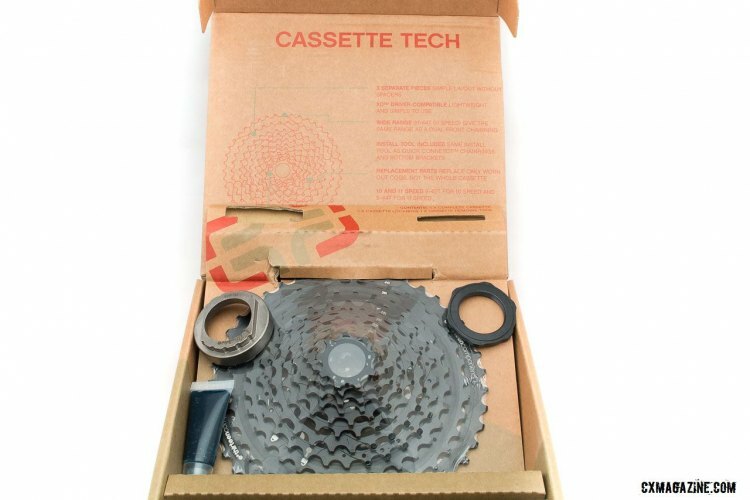 Riders can purchase replacement parts as they wear instead of having to buy an entire cassette. It’s also designed to work with SRAM and Shimano drivetrains, although you’ll still need an XD Driver for whatever wheel you’re using. The TRS+ 9-44 11-speed cassette is constructed of aluminum and heat-treated chromoly and features a 9-10-12-14-17-20-24-28-32-38-44 cog spread. In house, the cassette weighs in at 325 grams on the Cyclocross Magazine scale against a claimed weight of 320 grams. Not bad. You can also get it in any color, as long as it’s black. The TRS+ 9-44 cassette retails for $300 USD. 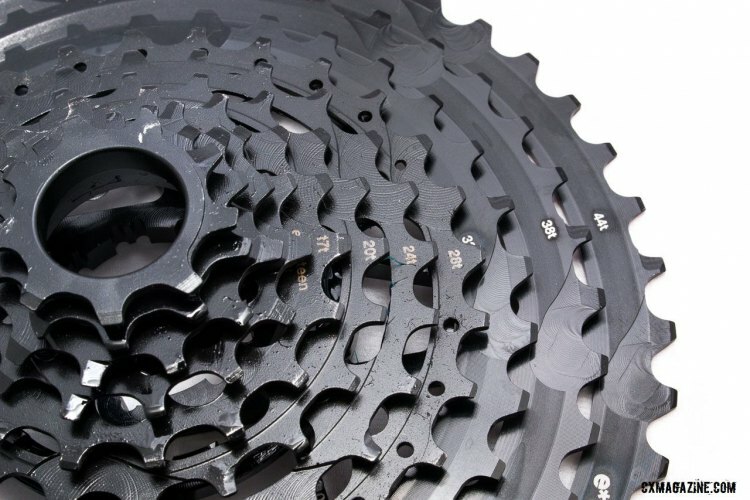 As E*Thirteen points out, compared against SRAM’s 12-speed Eagle drivetrain, which boasts a 500% range but costs roughly $1,200 USD, the TRS+ 9-44 11-speed cassette and it’s 489% range is a huge bargain, even with the needed XD Driver. We’re believers in wider gear ranges for gravel racing and adventure riding and E*Thirteen’s new 9-44 cassette may just fit the bill for your low gear needs.